in so many words...: Best Movie Moms: For me, there are only two. I wanted to do this post quickly, from the gut. Quick, quick Yvette, when you think of movie moms who is the first that jumps into your mind? For me, there are two and both are Disney creations. When I was a little kid my own great mom took me to see BAMBI. As you may imagine I sniffled and got all teary during part of the movie. The funny thing though is how the film affected me then - in a very specific way - and continues to affect me in memory. I can't watch BAMBI anymore and unless my granddaughter requests it at some point, I won't watch it again. It makes me feel the same sad thing I felt when I was a kid. 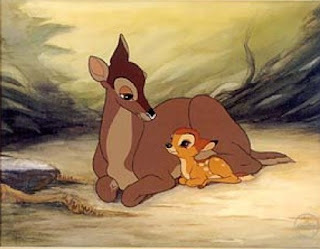 But if you ask me what the ideal mom is or should be, I say: Bambi's mom. Sitting in that theater seat next to my own mom watching Bambi's mom sending Bambi off when she sensed the hunters getting closer in the forest - telling him not to look back no matter what, to run as quickly as he could - he did NOT know, but she did know she would decoy the hunters and was probably going to her death - yeah, even as a kid, I knew that that's what a real mom does. Simplistic I know, but that's how that scene in the film affected me then and now. 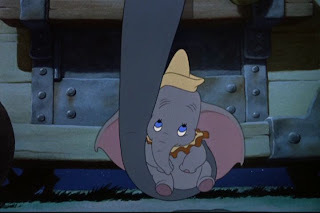 The second mom I have great affection for is DUMBO's. I love that she wears a little pink curly brimmed cap - and the way she looks at her little elephant calf, even when she realizes that his ears are humongous. Nothing can mar his perfection in her eyes. When the other elephant moms (and the clowns) make fun of Dumbo and the fun becomes intolerable during a performance, she breaks loose and tries to help her boy. The handlers imprison her in a padlocked wagon, but she sticks her truck through the bars in the door and rocks her baby to sleep. SO damn touching. These are two moms in two movies that have always defined motherhood for me. I still tear up when I watch Bambi, and sweet Dumbo! When Walt Disney was criticized about some harsh scenes in his movies he responded that he believed children should not be shielded from reality. When I was in San Francisco this past year I enjoyed visiting a very in depth and fascinating new museum that was devoted to him. You would love it, Yvette! I love Bambi's mother. There is another mother that reminds me a lot of her. In the Rankin & Bass Christmas special, Nestor The Long Eared Christmas Donkey, Nestor's mother sacrafices it all to protect him. It's so sad. Both gentle and protective mothers. And (am I remembering correctly?) both single mothers... Great choices, Yvette, you've made me want to watch some Disney. I ought to find 'Bambi', I don't think I've ever seen it. I read an article several years ago that said that the three movies that traumatized young children the most were "Bambi," because of the mother's death; "The Wizard of Oz," and "Snow White." (The last one I know as I crawled under a theater seat at the age of 4). There have always been questions about Disney's portrayal or nonportrayal of mothers; either they were terrible or died or were simply nonexistent. Has anyone followed this? Bambi may be the only animated film in which the main character has two parent for most of the movie. Disney loves the single parent idea. And so few mothers. Stepmothers not included here. It's usually a single dad: PINOCCHIO, LITTLE MERMAID, ALADDIN, BEAUTY & THE BEAST, FINDING NEMO. I can only think of PETER PAN with Mr. and Mrs. Darling and 101 DALMATIANS with Pongo and Perdita as animated movies where two parents survived the entire movie. It's either one alone or one of the parents is killed off at some point (BAMBI, FINDING NEMO, THE LION KING). This is a Disney cartoon phenomenon. It seems to have carried itself into their TV shows now. Pat: I wish I could see that Disney museum, sounds like something I'd really enjoy. But, next best thing: I've got a Disney biography lined up on my TBR pile. The latest one, out last year I think, is supposed to be wonderful. A Happy Mother's Day back at you, Pat. We could do this all day long. :) A Catholic mother can't be TOO happy, though. HA!! Nicolas: BAMBI is a classic for a reason. If you haven't seen it, you really should. But bring a hanky :) Nah - You're probably at the age when you're too jaded and sophisticated to get teary-eyed. But I find it a very moving film. I won't watch it again as I said, too full of sad memories for me. But I still remember Bambi's mother as The Classic Mom. A very associative film for me, obviously. I also remember the image of the father as he steps in later in the film. Ye gads, no real father could live up the image Disney's animators created. (I guess I'll find out more when I read his bio) but I do know that Bambi's mom, for me, is 'not to be fooled with'. She is the perfect mom in my eyes. A mom who did what she HAD TO DO to protect her child. What more could anyone ask? I think, you know, happiness doesn't make for very good drama so you'll rarely find a story or film simply about a happy family going about its business. "All happy families are alike..." Tolstoy was not wrong when he coined that snappy phrase. I was not traumatized by BAMBI, rather, it impressed me. I guess I was at just the right age to see it. I took my daughter to see it many years later and she was not traumatized in the slightest - far as I could tell. She didn't even shed a tear. I was kind of disppointed that she hadn't seen the same things I saw. I think, possibly, I waited too long to take her. Who can tell? John, I think we are all the sums of many varied parts. Too much analyzing is too much analyzing. Who knows why Disney chose the stories he did? I'm just glad, in balance, that he chose just the right ones for me. Oh, I haven't become jaded. I cry at movies all of the time, even the news sometimes. I would cry seeing Bambi. I saw an ad from a stop smoking campaign showing a very sick baby, I was bawling. What can I say? We're total mushes. Me too, Kathy. I can't even hear the opening theme to LASSIE and I start crying. HA! All Mushes of the World UNITE! I don't even remember watching Bambi as a kid ... I will need to get it for Julianna and watch it with her. Skye: Yeah, but don't let her see while she's TOO young. You will have lots of explaining to do. Also it might frighten her. I saw it at just the right time. I think I was 5 or 6. But I saw it in the theater. Yes, wait until she's older. The Bambi movie can traumatize young children about the mother getting killed. And be careful with Snow White. I had a meltdown at four, hid under the seat and had to be taken out of the theater; it was the wicked stepmother and the poisoned apple scene -- I still remember it. Kathy: Yeah, SNOW WHITE is pretty scary, I guess. Kids might misinterpret what's going on. Same with BAMBI. I'll remind my daughter to take care. The scene where the queen turns into that ravaged old hag is kind of dark and nasty. But I'm sure my daughter will investigate anything she puts in front of her daughter's impressionable eyes. Aw, this is so true! I have always loved Bambi!! And his mom really was the best mom! I love that scene when she takes him to the meadow for the first time too, you cautious she is...and the way she she looks at him every time, lovingly - she is the perfect mother! Dumbo was probably my second favourite! I love that guy :) You're right, his mother was always so protective! And the picture that you've put - that scene is absolutely adorable!! Priya: Yes, the best. I've always loved them. Especially the earlier ones. I can't wait for my granddaughter to experience these classics. Bambi's mom is a great example of what a mom should be. And Dumbo's mom is such a dear. I hate that scene when they lock her up. But when she tucks her trunk through the bars and cuddles him, I get all misty.